Ford was one of the Detroit Three, and as such, a big ship to turn around. The magnitude of this change would necessitate complete employee engagement. Ford’s CEO, Alan Mulally, knew this. Many of us will not be confronted with the magnitude of change required to turn Ford around, but employee engagement is a critical issue in all businesses. Engaged employees achieve higher levels of productivity, and facilitate healthier relationships with peers and customers. Disengaged employees generally don’t leave; they stay and adversely affect productivity and relationships. Organizational leadership must consider how to best impact employee engagement en-route to sustainable high performance. Healthy cultures facilitate employee engagement. Culture is ultimately leadership behavior. Therefore, what a leader models, communicates, orients, supports, measures and holds accountable, is what will determine the health of organizational culture. Every organization has a culture, healthy or not. A few signs of unhealthy culture are fear, mistrust, blaming, silo / individualist behavior, poor communication, and lack of clarity in objectives. 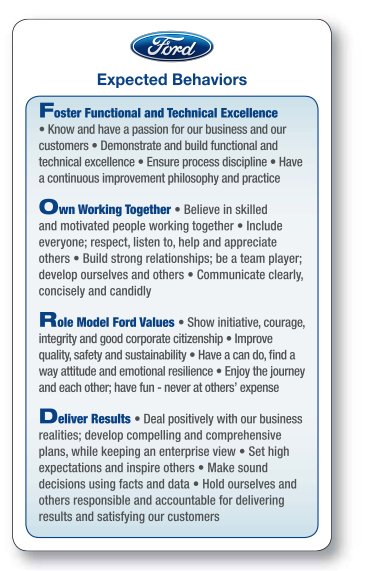 In my last column, I relayed how Ford’s CEO Alan Mulally established a clear vision for change (summarized on the front of the One Ford card), and further worked with the leadership team to establish, communicate and measure expected behaviors (summarized on the back side of the One Ford card, shown here) by which all employees would be held supported and accountable. Implementation takes consistent dedication of time, effort and resources. According to Michele Jayne, project manager for the One Ford card, “Communication began with the leadership team first. Alan connected with all salaried employees directly, and lead executives connected directly with their employees. To further support the cultural change, the One Ford card was accompanied by posters, articles and the development of an internal website.” All of these actions were undertaken to ensure that expectations were clearly communicated and that employees would be supported in their change. Ford’s resources, such as classes, books, web links and articles, target the support of each articulated expectation. If an employee wants to know how they can be better at their ability to “build strong relationships”, there are resources to support them. Ford is engaging its employees. More importantly, Ford’s executives are engaging with employees. No one expects a leader to be perfect; perfection is impossible. Engagement will require that a leader vulnerably model and be held accountable to the same expected behaviors as everyone else…and to model reconciliation when they fail.